Based on the book "Neon Angel: The Cherie Currie Story" by Cherie Currie, The Runaways focuses on the rise and eventual dissolution of the groundbreaking all-girl rock band of the same name. Respected film critic Roger Ebert gets some credit for the all-girl band concept, since as he states in his commentary for Beyond the Valley of the Dolls (for which he was the screenwriter), the film’s fictional group The Carrie Nations inspired many followers in real life. In a case of life imitating art, the true story of The Runaways is remarkably similar to the one created by Ebert. The Runaways lasted from 1975-79 after guitarist Joan Jett and drummer Sandy West separately approached music producer Kim Fowley about forming a female rock band. After auditioning for bandmates, they chose Cherie Currie to be their lead singer. The released several albums and achieved a respectable degree of success. But Currie succumbed to her drug problems and left, while the rest of the band had a falling out with Fowley. Jett subsequently went on to even greater success with The Blackhearts. 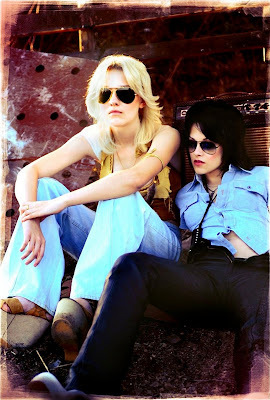 Kristen Stewart manages well enough with her portrayal of Jett. But her story seems less interesting than it should be. Perhaps that’s because she became the most famous but this story happens at a time before she reached her peak. So the story can only hint at what is yet to come. Since the story is based on Currie’s book, it’s no surprise that her story has much more drama. Dakota Fanning portrays Currie with a both innocence and intensity. This is a nice breakout role for her. Oscar-nominated Michael Shannon plays scene-stealer again with his turn as their producer Fowley. He bristles with energy, goading the girls with cries of “This is not about women’s lib, it’s about women’s libido!” He’s inspiring and driven, but also sleazy and abusive. The Runaways captures an incredible feeling of authenticity and the rock-and-roll lifestyle. If somewhat conventional, that’s because that story happens time and again. The difference here is that they were teenage girls and so had lots of other issues, getting flack from both audiences and other (male) bands. There is a lot that unfortunately gets left out (getting arrested, an abortion, etc.) but in a normal-length feature that already deals with drugs, teenage sexuality and lesbianism it would have been impossible to pack it all into the story. Fortunately, writer/director Floria Sigismondi demonstrates her total affinity with the subjects. Although director Floria Sigismondi was born in Italy, she moved with her family to the Greater Toronto Area at age two. After studying at the Ontario College of Art (now the Ontario College of Art and Design) she became a successful music video director, having made videos for such diverse performers as Marilyn Manson, David Bowie, Christina Aguilera, the White Stripes and Leonard Cohen. She knows her rock music, and she has a great sense of visual style. Additionally, Cherie Currie and Joan Jett were both consultants for the film, and Joan Jett acted as Executive Producer. It isn't surprising then that they get so much right where other rock movies fall short. Floria Sigismondi was on hand for the Toronto premiere of the film. Statuesque and stylish, she was very warm and personable as well. The Runaways is her debut feature film, and announces the bold arrival of yet another highly talented woman filmmaker.